3D technology has been pretty slow in being a part of our everyday lives, mainly cause of the odd glasses you need wear to view the content, and also because of the high price of the technology. That may not be the case anymore. LG electronics unveiled the world's first Glasses-free 3D monitor with eye-tracking technology. The special feature of the monitor is it utilizes 'eye-tracking technology' to maintain an optimal 3D image from a range of viewing angles, this has been made possible because of the integrated webcam in the top sleeve of the screen. The 20-inch D2000 (called DX2000 in Korea) is a monitor developed to work as a fully functional entertainment display capable of reproducing games, movies and images in all their realism. 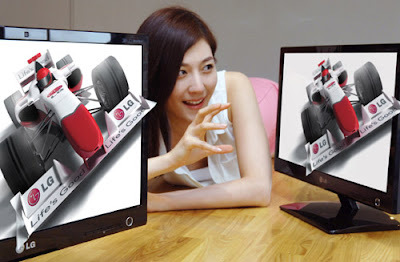 LG already has a full line-up of 3D TVs, laptops, projectors and smartphones making LG Electronics by far an industry leader in all 3D technologies. The LG Cinema 3D D2000 converts 2D content into 3D, although it's unclear whether it allows both 2D and 3D content to be viewed at the same time. The new display is LED back-lit, has a maximum resolution of 1600 x 900 pixels, 5ms response time, and contrast ratio1,000:1. The 2D image brightness is a maximum of 250 cd/m2 and the display comes with HDMI and DVI ports. The main feature of this display is that its 'glasses-free'. Existing 3D technologies generally requires viewers to stay within a tightly restricted angle and distance to perceive the 3D images. However, the eye tracking in the D2000 works via a special integrated camera sensor attached to the monitor which detects changes in the user’s eye position in real-time, the monitor calculates the angle and position of the viewer and adjusts the displayed image for the optimal 3D effect. Although what this makes me think is that its probably only possible for one viewer to get the perfect 3D effect if we have multiple viewers, its a PC monitor after all. The LG Cinema 3D D2000 will be available soon sometime this month in Korea priced at KRW1.29 million and around the world in the 'latter part of 2011' as the press release says. (For around US$1,222).